For the last few days I’ve had the absolute pleasure of working as a volunteer on the build stage of a show garden at RHS Hampton Court Flower Show. First off I am hugely grateful to Charlie Bloom for taking a gamble on a total stranger via Twitter, adding me to Team Colour Box and welcoming me in to what feels just like a tight-knit family. It’s no small thing to let in someone you know nothing about when you’re in the running for medals. Colour Box is away from the norm in show gardens. 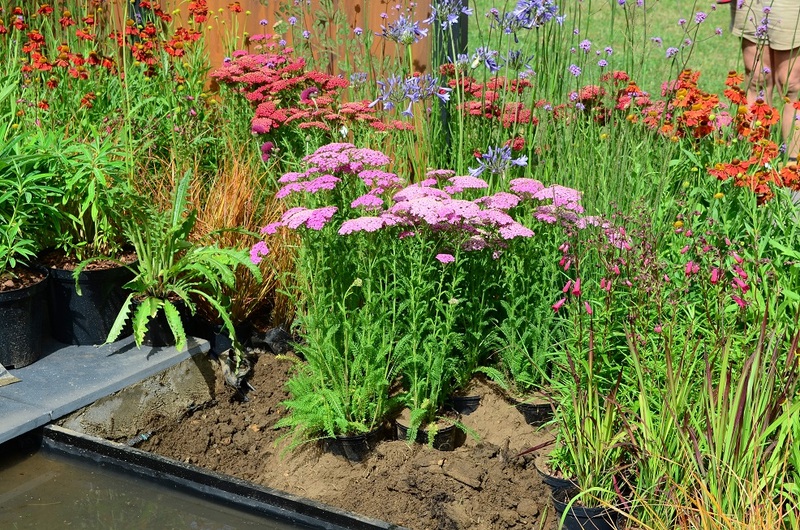 It was put together collaboratively and on a small budget, to show people that they can achieve a stunning garden without spending astronomical sums. 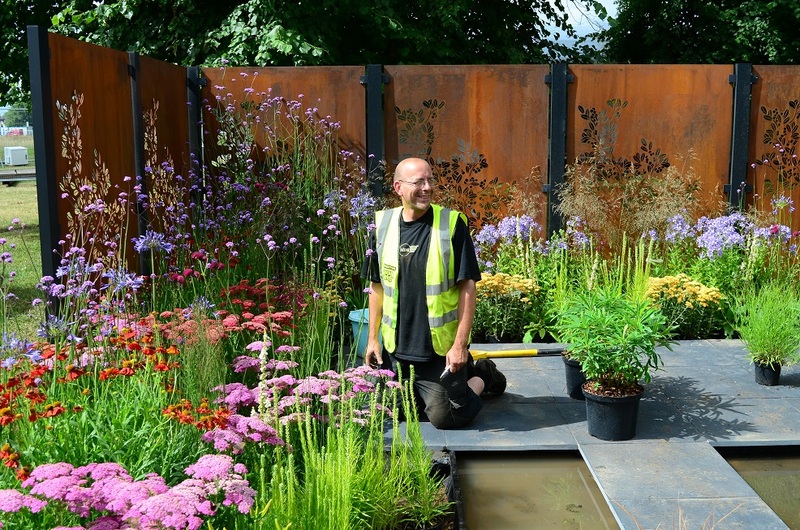 The corten panels from Stark & Greensmith are gorgeous and set off the vibrant colours in the planting. Show gardens are amazing things. Removed in a few hours at the end of the week, they are built to look fully established. And before Friday I had zero awareness of just how much work that entails. You start at 7 or 8am and you finish 12-14 hours later. I didn’t realise that the whole garden is usually sat in pots, painstakingly stabilised and buried in Hampton Court’s scrubby, sandy soil and top dressed with just a few inches of beautiful black soil improver. All of which has to be carried carefully over the landscaping in buckets and gently trowelled or added by hand. Getting as little as possible on plant leaves because that loses you marks. It’s very good for bingo wings…! I’ve learned so much. Everything is meticulous. Being a perfectionist properly pays off. Charlie and Simon Webster (also on the team, also a medal-winning show gardener) were super-organised and had the build broken down into days, so we knew what needed to be done by when. The plot is dug out to just below the average level of the plant pots so there is less infilling to do and the garden is ready more quickly. That can mean some plant rims stand proud, which, again, loses you marks. After every watering we checked to see if any of the plant pots were showing – to the extent that you don’t quite trust what you’re seeing. A bit like The Sixth Sense, but with plastic rims instead of dead people. Every single imperfect leaf or flower is removed before the judging. So few words….so much work. I spent all Saturday just finnicking around with the plants. Colour Box is a small garden, but it still has 400+ plants in it. And the beds are deep in places, even for my very long arms. While I like its stems and flowers, I have grown to loathe the foliage of verbena bonariensis, with the fiddly yellowing leaves at its base. Achillea millefolium has hundreds of lovely feathery leaves which go bright yellow before dying off, and any dead or on-the-turn leaves need to come out. Eryngium bits (not on Charlie’s garden, I also had a day on Freddie Whyte’s fabulous On the Edge garden) are currently embedded in my thumb, somewhat painfully. Through this I have also learned the importance of a good, well-padded kneeler and gloves. The black top-dressing stains your hands (and anything else) and you can end up looking like you’ve spent a few hours down t’pit. But while you’re working in summer’s heat, grubbling about on your knees and squinting at leaves, you have time. Time to watch the wildlife discovering a new temporary haven – including the odd escapee from the butterfly dome. Time to look at, and really appreciate, the planting, from angles you will never see as a punter. The combinations on both Charlie and Freddie’s gardens are very different but both equally stunning. Both of them more than deserve the Silver Gilts they’ve been awarded. I was lucky, in that Charlie and her team are all experienced at this and the build went well. Finishing planting on the Friday means a day for the plants to relax while you titivate. 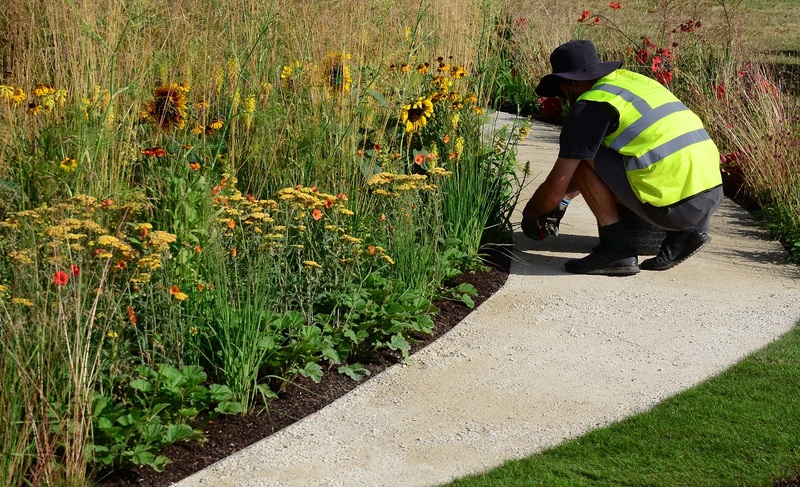 On a few other gardens, with complex landscaping, big plots and small or inexperienced teams you could feel the tension. Late on Saturday night one garden had barely started planting, with the judging happening on Sunday. It only takes a problem with the landscaping or 1-2 people not turning up to throw the whole schedule and the hours disappear at a frightening rate. There’s so much invested in creating the perfect space before judges appear with their clipboards. There are also massive perks to being on the build stage. You get to meet and talk to other gardeners, watching their gardens develop from bare earth and seeing them get to peak condition before anyone else. You can wander around the marquees, eye up potential purchases and talk to exhibitors there while they trim their lavender with tweezers or balance dahlias on upturned pots to get them to the right height. 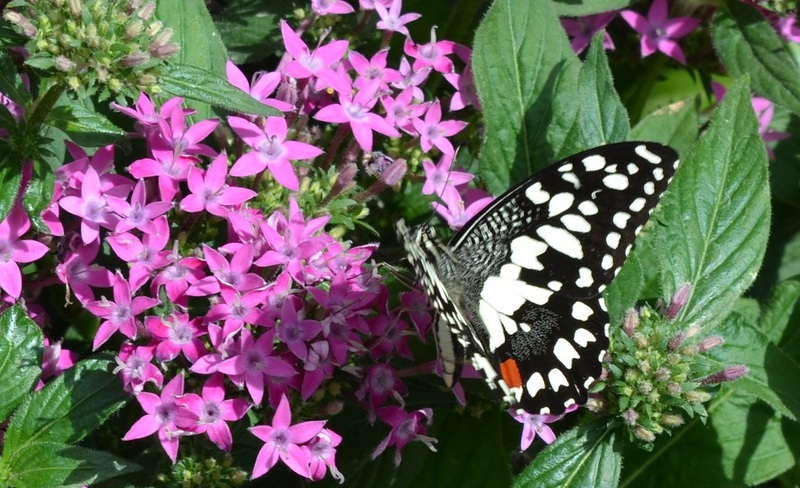 The butterfly dome is empty of people, but full of newly hatched, fluttering colour. And there are the skips. There is a lot of waste at the show, to quite shocking levels, despite the RHS’s efforts to minimise it. 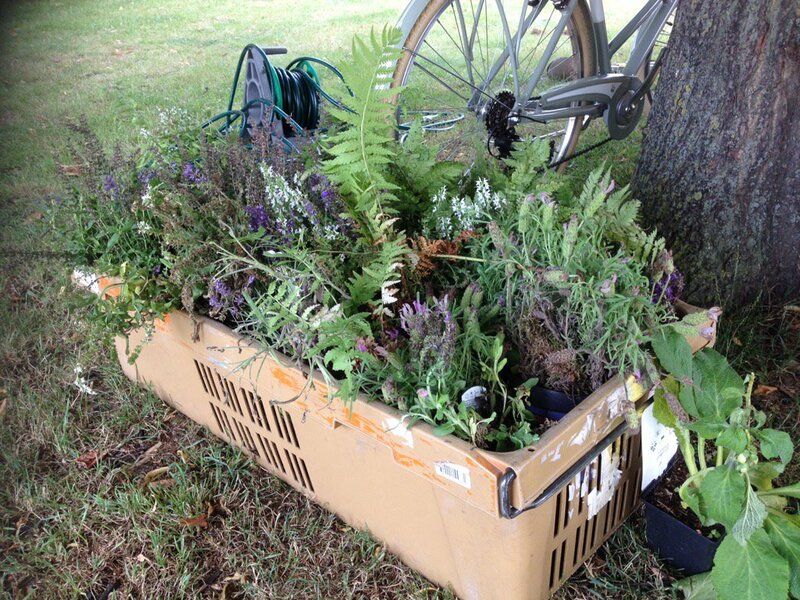 On my first day I rescued a crate of lavenders, salvias and ferns for Epsom RDA. A tray of ammi majus was on top of the skip on my second day, and I know under it were at least 6 rolls of turf because I saw the person chucking them in. I took away about 150 square 3inch pots, and some massive planters on day three. Aside from pots & plants, there were lengths of timber, slates, pavers. This isn’t from show gardens as far as I can see. This is from the trade stands. In these cases they were all stands selling garden sculptures. It does make me angry and I wish there was more effort to have a better recycling scheme for the useful things – including plants – to reduce the landfill. 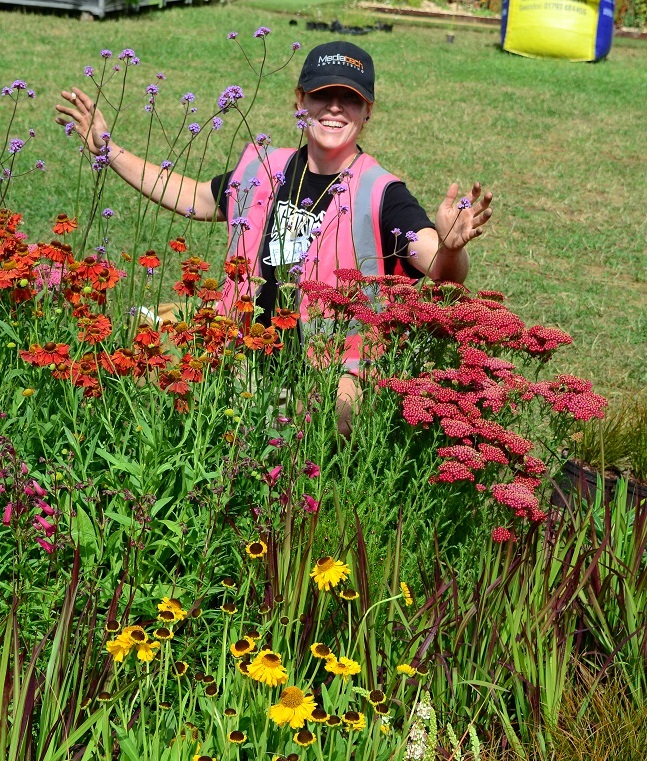 If garden centres can do it, why not the big flower shows? 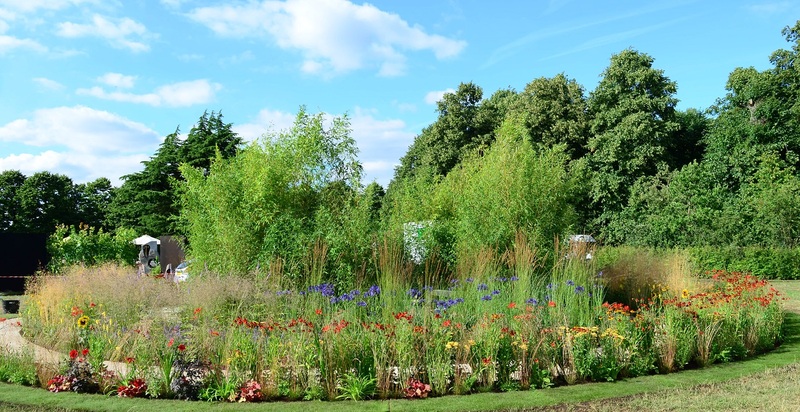 I have two more days at #RHSHampton, working as a guide on the Perennial Sanctuary garden designed by Tom Massey. It is even more beautiful than the design let on and I am looking forward to meeting people – if you are coming to the Show today or Thursday, please stop by and say hello – I wil l be in dayglo yellow….! And finally, I have a pass for Break Down Day, when I am arriving with a horse trailer and hoping to scrounge as many free plants for Epsom Riding for the Disabled as possible. We’ve built a new sensory track for our riders who we can’t take out into the countryside, but it desperately needs plants! I would do it all again in a heartbeat. It takes over your life a bit, it’s hard work, but it’s really rewarding. I came into it out of curiosity, wanting to know more about putting a garden together. I’ve come out of it as an enthusiast, and wanting to repeat the experience as often as I can. Thank you so much Charlie Bloom! It looked fantastic when I saw it on Monday, very vibrant… and happened to have attracted a load of gdnbloggers to it at the same time. A bit like the butterflies! I would love to revisit (and say ‘hello’) but sadly just too far away. I thought this was by far the best garden in the entire show and for me, the best garden I’ve seen all year. It is properly lovely. I wish it had had gold, but it wasn’t far off. Am so pleased for Charlie & Simon. Oh Beryl what an amazing time you had! I could feel my adrenaline rising as I read – brilliant piece of writing, you certainly got the tension across. I am glad they were times when you could enjoy the experience too. I enjoyed all of it! Even the trudgery of in-filling gets a bit zen-like. Am so glad it’s getting a lot of recognition, it’s well-deserved! Absolutely fantastic post, I always wondered how they did this. An amazing experience. thanks for sharing. Thanks – it’s well worth doing, if you can spare the time to volunteer. I’m hooked! I was there today. 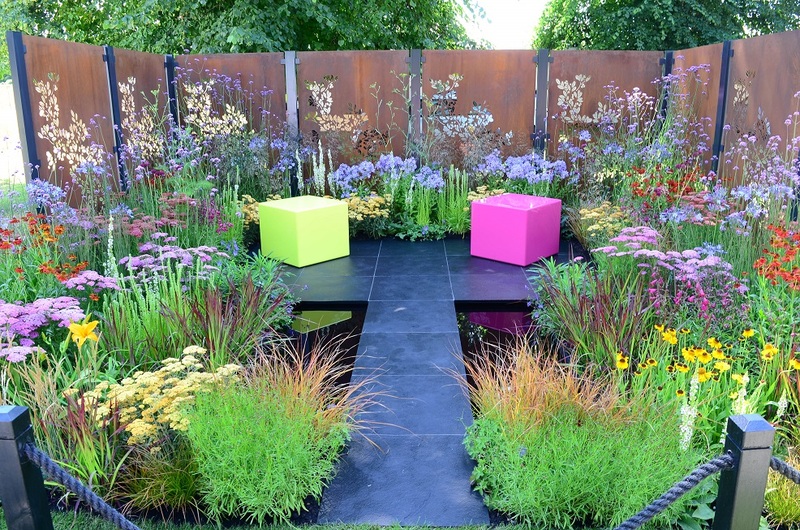 I loved the colour box garden – it worked from all angles. I also had a wander through the perennial sanctuary garden and chatted with a few of the volunteers. I also met a lady from Twickenham who has invited me to come and dig up a bit of the erigeron in her front garden rather than buying a pot of it! Gardening certainly makes the world smaller. Gardeners are such lovely people! I’m glad you liked Colour Box, I had another long stare at it today too, it’s getting a lot of well-deserved attention. Brill, thanks for sharing. Great insight into behind-the-scenes. Inwondrred how they got the plants potted up so fast after the show…! End result VERY colourful too. 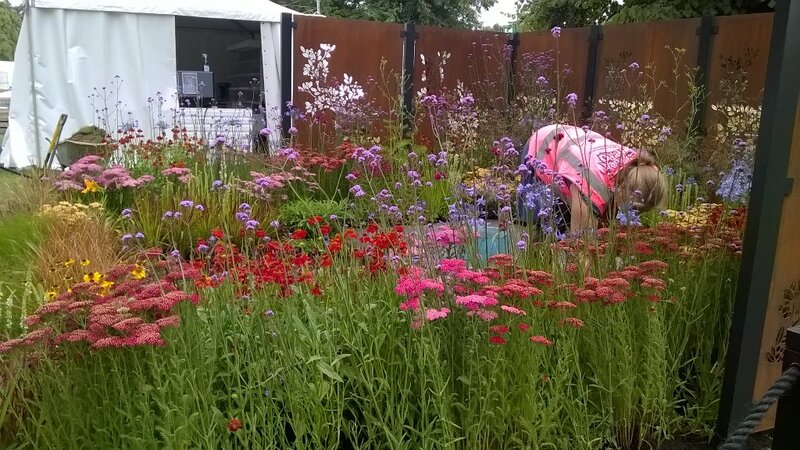 What an excellent insight into a show garden, thanks for letting us into some of preparation that goes on behind the scenes. Hope you get to fill your horse box as some payback for all your hard work.